← You don’t have to brush after every meal? Really! White, composite, fillings are tooth-colored and usually, will closely match the color of natural teeth. They are composed of a porcelain, resin material. Because composites are bonded into the tooth, this will add strength to the tooth and filling. I, personally, prefer composite fillings because the tooth preparation can be more conservative than amalgam, silver fillings. Bonding the white fillings to the teeth has vastly improved over the past 15 years and white fillings can last for 10-15 years. 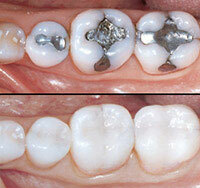 Silver, amalgam fillings are now comparable in strength, but may not be as conservative when the tooth is being prepared. Your dentist can give you information on what types of fillings are best for you so that your teeth can last a lifetime!